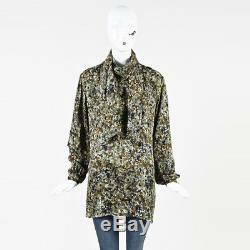 Gucci Green Multicolor Silk Printed Long Sleeve Tie Neck Blouse SZ 42. 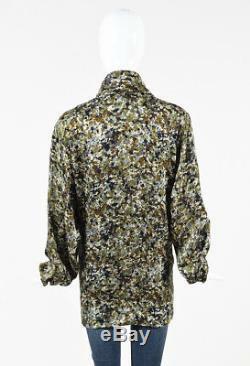 Gucci long-sleeved blouse featuring a multicolored abstract print, buttoned shoulder placket, and tie neck. Condition: This item is in excellent condition. May display minimal signs of wear including hairline scratches, minor wrinkling, and/or interior blemishes. Please reference photos and if you have any additional questions, please contact customer service. Color may appear differently on varying monitors and device settings. Please refer to measurements above as the item may have been altered. Luxury Garage Sale is a leading luxury consignment boutique that offers a curated designer shopping experience and white glove consignment services tailored to fit your needs. Discover our world class customer service! Shop our premier selection of top designers from around the world! LGS market experts authenticate, price, describe, and photograph every item, making it a truly simple and genuine experience. Consign those designer goodies taking up space in your closet! With Luxury Garage sale, it's easy. Send us your items and our experts will work to get you the best value for your pieces. Stop by one of four fabulous boutiques in Chicago, Dallas, and Minneapolis or one of our pop-ups across the country and let expert stylists walk you through our inventory. Be sure to follow us on Instagram, Facebook, Twitter, and Pinterest to stay up-to-date on the latest! We cannot cancel orders after a case is opened. ALL prices for items are priced in the United States Dollar. Please message us if you have any questions. Chicago, Old Town: 1658 N Wells St, Chicago IL 60614. Chicago, Gold Coast: 900 N Michigan Shops, Chicago IL 60611. Dallas: 6805 Snider Plaza, Dallas TX 75205. Minneapolis: 5051 France Ave South, Minneapolis MN 55410. We strive to provide the most accurate descriptions and photos as possible. Please note the following size chart is a general guideline. Size and fit are approximations and may vary across designers. Please refer to item measurements to determine best fit. Please send us a message if you have any further questions. What should I do if I never received my package? Next, please send us a message and we will work with the carrier to open an investigation. Please note that if the carrier finds that there was no mishandling of your package, there is no further action that we are able to take. Will my package require a signature? If you would like to find out if your package will require a signature please feel free to reach out our way. How will I know when my order is ready to be picked up? The item "Gucci Green Multicolor Silk Printed Long Sleeve Tie Neck Blouse SZ 42" is in sale since Tuesday, March 6, 2018. This item is in the category "Clothing, Shoes & Accessories\Women's Clothing\Tops".sale" and is located in US. This item can be shipped worldwide.